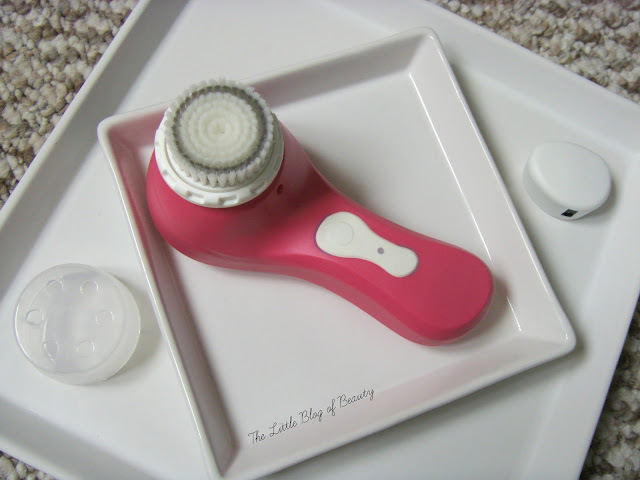 Ever since the Clarisonic was released a few years ago I've been curious about electronic cleansing brushes and have wanted to give one a go. One concern I've always had though is that a cleansing brush would be too harsh for my skin and so haven't invested in one, as they can be quite an expensive purchase. I once bought a little hand held manual cleansing brush from The Body Shop and when I gave it a try I just found it painful and not a pleasant experience at all, so it did put me off to be honest. Earlier this year I came across a Magnitone display with a brush attached and I took the opportunity to have a little stroke of the bristles. 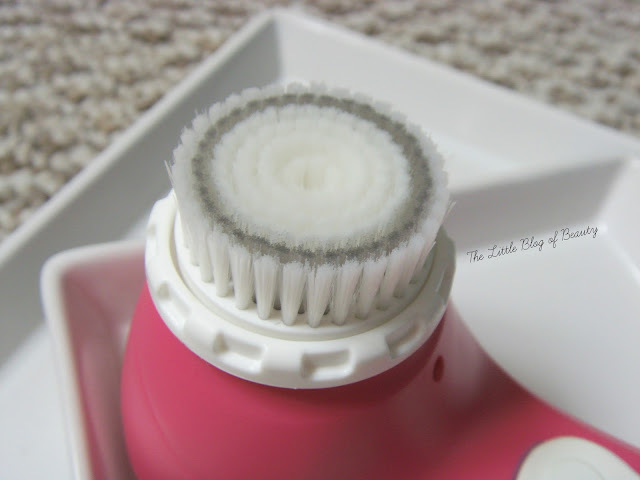 I was actually surprised by how soft the bristles felt, but I was still unsure about spending that much money and couldn't really afford to either. A few weeks ago The Bloggers Hub held a Twitter party in association with Magnitone and were offering cleansing brushes for bloggers to review. I decided this might be a good opportunity to try one out so I entered my details and was lucky enough to be selected and was sent the Magnitone Lucid cleansing brush*. The brush is available in four colours, plush pink, aqua green, dazzling blue and sunshine yellow and I was actually able to pick the colour I wanted so I decided to go for the pink. One of the things I like most about the Magnitone Lucid is that it's a sealed unit meaning it's completely waterproof, so you can use it in the shower if you wish. Being sealed means there's nowhere to plug in a charging cable, which does appear to be a bit of a problem when the battery runs out. However this comes with a little pebble like thing (you can see it in the picture above) which you can plug in to a charging cable. This then attaches to the Magnitone magnetically at the bottom of the handle and this charges it up. A full charge lasts around two weeks, so if you're going away on holiday you can charge it up beforehand and not worry about taking the charger with you. The brush is really simple to use. You remove the protective cover and wet the brush head with warm water. You wet your face as well and then can apply your choice of cleanser either directly to the brush head or you can apply it to straight to your face. There are just two modes on the brush; you press the large white button once for the standard deep cleansing mode and press it again for sensitive mode. The brush has a timer and beeps to let you know when it's time to move onto the next area of your face before stopping automatically when the time is up. You get 20 seconds for your forehead and brow area, 20 seconds for the cheeks and 20 seconds for your nose and chin. I thought it would beep to give you 10 seconds for each cheek but it only actually beeps in 20 second intervals, once to tell you to move on to your cheeks and then to move on to your nose and chin, so you do need to remember to move to the other cheek without a beep prompt. Although this was a 7 day challenge, as I've mentioned I was concerned this might be too harsh for my sensitive skin so to begin with I wasn't sure that I would use it every day for 7 days. I needn't have worried though as I've used this every evening since I had it, with the exception of the evening I was staying in London as I didn't want to take it with me. I only use this on the sensitive setting and I make sure I only lightly go over the top of each cheek once, as this is the most sensitive area of my face, but I haven't found it too harsh at all and have actually really enjoyed using it. I think my favourite area to use it on is over and around my nose as you can really feel the vibrations and my nose still feels like it's vibrating slightly for a minute or two afterwards. My nose is also one of the areas where I've seen the most improvement in my skin as my pores appear much clearer now. The other area would be my chin. I think a combination of this and hormones/stress did break me out quite badly when I first started using it but that has completely cleared up now and the pores on my chin are also looking much clearer. I do suffer with congested pores on my chin after years of acne have left my skin with a pitted appearance, but this is really helping to clear them out. I've noticed since using this that my skin feels lovely and smooth and also that products are absorbing better, which is great for me as despite having dry and dehydrated skin it really does struggle to absorb products. The only thing I'm not that keen on is that it is a bit of a flicker, so your bathroom mirror/sink/floor might end up with a few cleanser spots all over them. Overall I've really enjoyed using the Magnitone Lucid cleansing brush and if you're worried that this might be too harsh for your sensitive skin I'd say give it a try. Magnitone have kindly given me a 20% discount code for my readers to use to buy their own Magnitone Lucid. All you need to do is follow this link and enter code Becky20 and you'll get the Magnitone Lucid for just £55.99 rather than £69.99. Be quick though as the offer expires 1st June 2015. 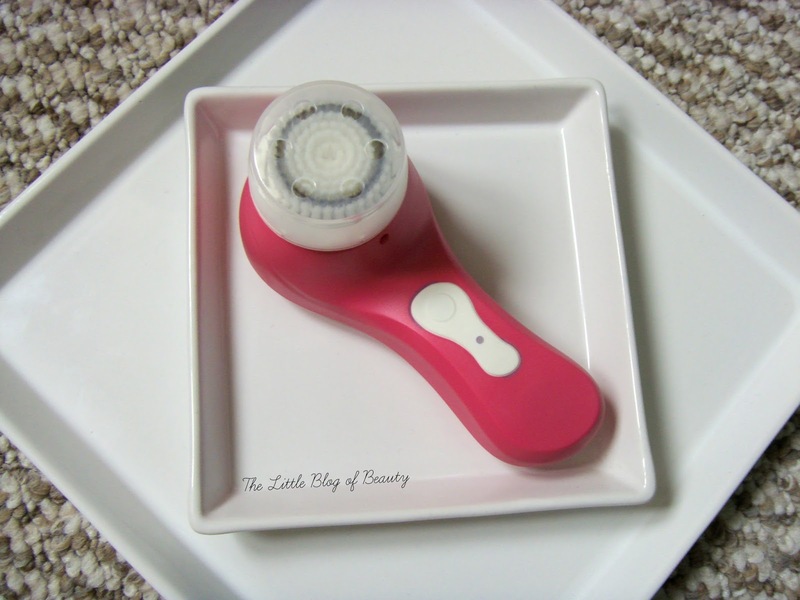 Have you tried a Magnitone Lucid or would you give one a try? I was testing this out too, I've been enjoying it more and more the longer I use it. I have this brush and I'm a HUGE fan!